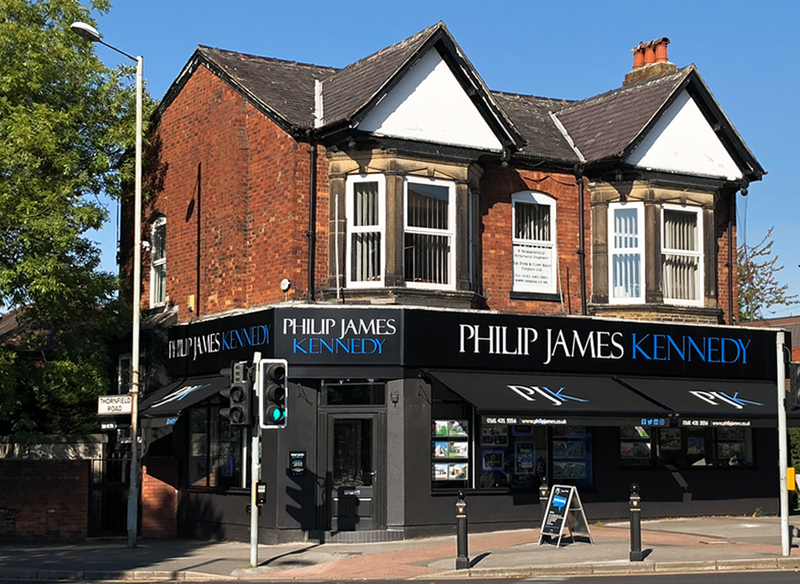 All the team at Philip James Kennedy share the ethos of being completely customer focused and as such the office is open until 6pm during the week to maximise the time we can communicate with our clients. In addition our professional representatives carry out viewings until 8pm. Our high staff to property ratio is unrivalled with a 10 strong sales team, who have a combined estate agency experience of over 120 years! Our corner position office is perfectly located on the eye catching corner of Heaton Moor Road and Thornfield Road. Your home will constantly feature in our state of the art Heaton Moor office which has large window displays with halo lighting and cinema television screens to maximise impact. Inside is a large and comfortable marketing encouraging as many potential buyers as possible to arrange viewings on our clients properties. 16 years of unrivalled success. Our Passion for property & personal approach is second to none. The Heatons- Moor, Chapel, Mersey and Norris- are four small suburbs of Stockport which form a family-friendly, leafy part of the South Manchester area. The area is one of the most popular residential locations with a wide variety of exclusive properties with early Victorian cottages; late Victorian terraces and traditional semi’s through to ‘Arts and Crafts’ detatched family homes and futuristic apartment and townhouse developments. Heaton moor is an affluent area with the attraction of Heaton Moor and Thornfield Parks. There are a wide range of sporting facilities such as crown green bowling, tennis and golf and outstanding schools, specialist food shops, a well established café culture, upmarket bars and award winning restaurants. Enviably located close to the local motorway network, with Manchester City Centre easily accessible by either road or rail, via Heaton Chapel train station or the Metrolink network. Manchester international airport is also conveniently positioned. We like to support local schools & charities whenever we can. We regularly display children’s artwork in our windows and favour local businesses for signage, flowers and meetings. We were delighted to be the main stage sponsors of the Heatons festival – a wonderful event which really brings our thriving community together. Prompt with replies and liaising between ourselves, the vendors and solicitors. Made us feel extremely comfortable with the whole process would highly recommend. I cannot recommend this company enough! I have had excellent service from them from the initial valuation, through to viewings, exchange and completion. In particular Lisa Aspinall was amazing and without her constant reassurance and pushing the sale forward I don't think we would have got to completion. Her efforts with chasing up the buyers and their buyer were extremely helpful and she was always on hand to answer any queries I had. All in all an excellent service.